Drive E-16 (the main hwy. connecting Oslo and Bergen) to the road fork called Tyinkrysset, where a road branches north signed for Årdal. Drive up the hill to the lake, turn right here (good quality dirt road) signed for Eidsbugarden. Follow this to the north end of Lake Tyin, the hotel Tyinholmen is located here. The road to Eidsbugarden turns away from the lake, while a smaller dirt road runs west along the north shore of the lake. Drive this road (a bit rough) until it you reach a locked gate right next to a bridge where the road crosses a river. Find parking along the side of the road, making certain that you do not block the road. Park here,approximate location is N61.3775, E008.1634. Contine along the road until it ends near a building. 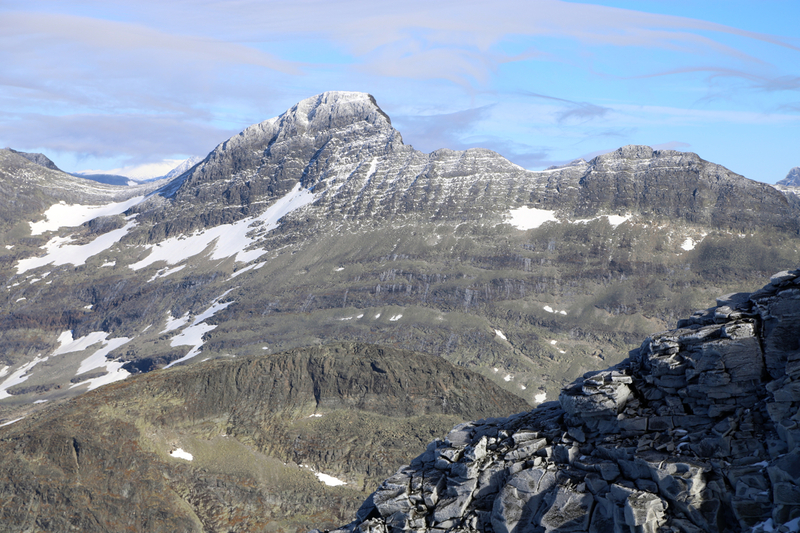 From here, a path marked by cairns continues west into the Koldedalen valley. The trail first runs north of the first lake, near the west end, a large, steep patch of snow extends into the lake. Cross this patch with care. Late in the season, one maay walk around this patch on its upper (higher) end. Continue to the next lake, called Andrevatnet. This trail is partly quite rough with many sections with boulders where care is needed. Cross the river/creek that comes down from your right, then head uphill, while still ascending left. You will find cairns and traces of the path as it heads uphill, this time going right, to the base of the more smooth rock above. Fortunately, there are natural passages and quite a few cracks and easier sections as cairns (look carefully for them) show the zig-zag way uphill. This section should not pose any problems when the rock is dry. It may be quite a bit more challenging when wet and the route should be avoided entirely if there is ice on the rocks. Higher up, the terrain again levels off as the route runs into a bowl below the lower part of what used to be a single glacier, now split into a lower (tiny) part and the upper (larger) part. Proceed uphill on the right side of the bowl. You will now see Stølsnostind straight ahead, the smaller Midtre Stølsnostind to the right while Falketind is far right. 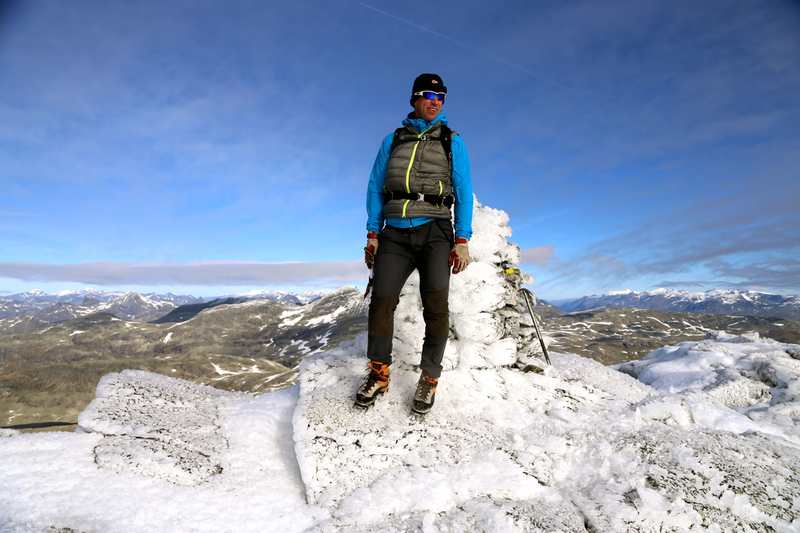 The best route to Stølsnostind is to traverse snow-fields that ascend towards the peak on the left side of the saddle between the two summits. One can then pick a zig-zag route largely on pretty loose and somewhat nasty ground, that connects to the ridge part-way up, roughly where the ridge that rises from the saddle makes a small bend. Once on the main ridge, continue uphill, largely on pretty easy blocks of rock that requires easy YDS class 3 scrambling. The summit is marked with a nice cairn. 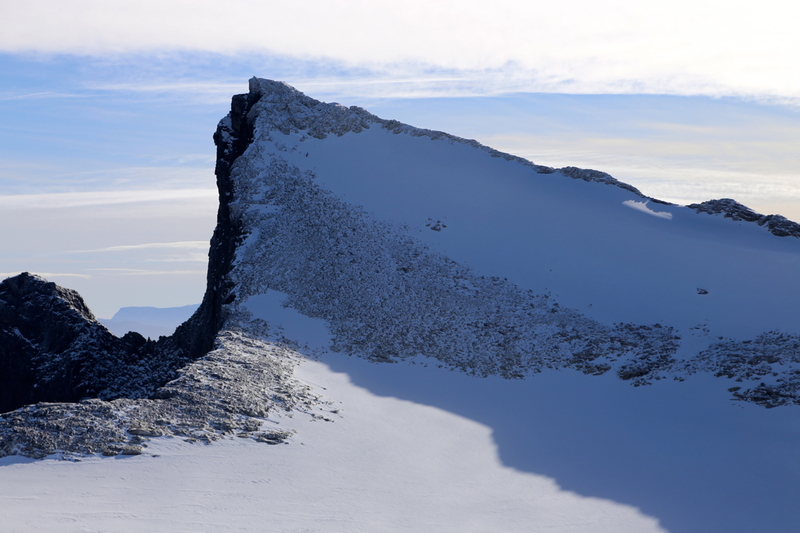 Note: A longer and slightly more difficult route will be to first climb the middle peak, ascending this on easy ground from the right side (as viewed when approaching). One may the continue over the top of this peak (2002 meter high), then descend to the connecting saddle. This descent is easiest by climbing down on the left side of the ridge. This descent is fairly easy on dry rock, but quite a bit harder when there is snow/ice on the route. We had a pretty late breakfast at Eidsbugarden and did not leave the hotel before 0830. To park several cars near the end of the road took some additional time, but we started hiking shortly after 0900. 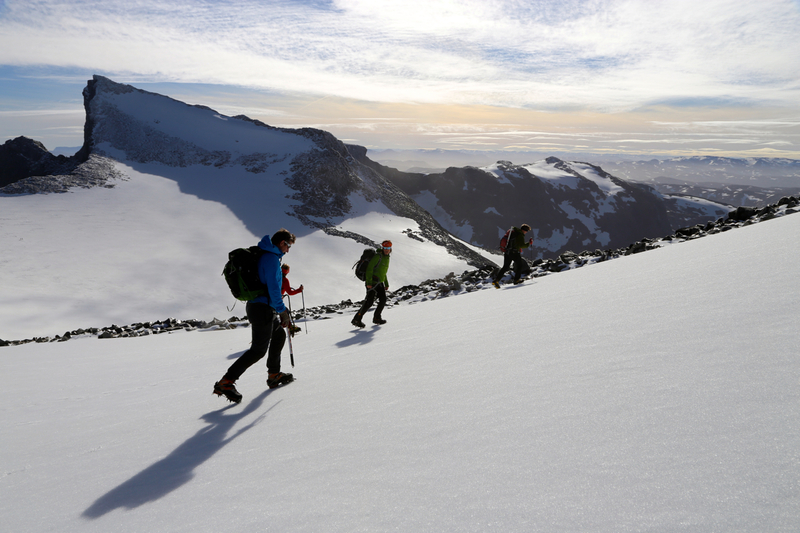 The trail into Koldedalen is not exactly an easy trail and it soon became clear that the group needed to split up if at least a few should have a chance to make the summit. We were near the creek that drains down into the lake Andrevatnet at 1130, so 2.5 hours to here. 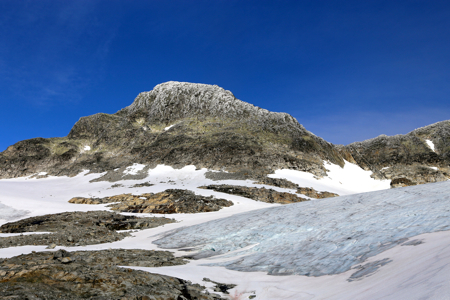 We were 8 that headed up the first (YDS) class 3 section, crossing the rocks and entering the basin below the glacier. 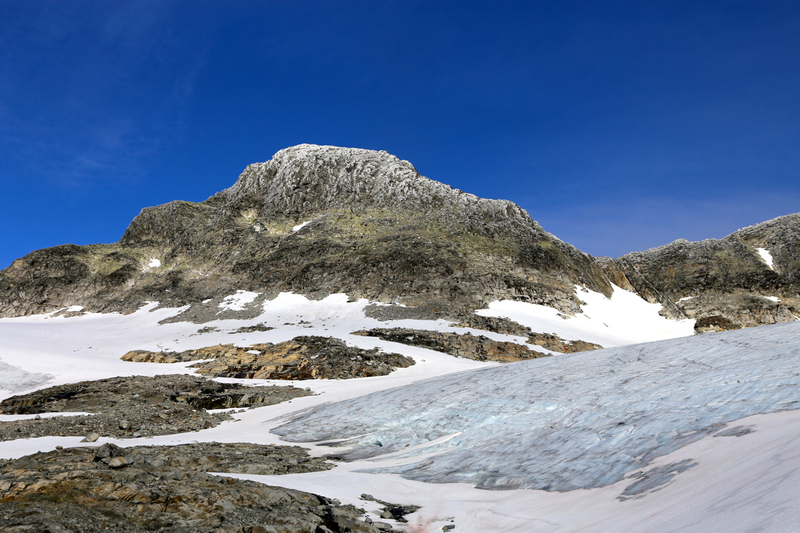 Crampons were needed in order to cross directly up the blue-ice glacier, however one might have circumvented this at little additional cost by walking in a larger arc closer to the base of Falketind. As nobody really knew the route, we went for the safe option to first climb the middle peak. 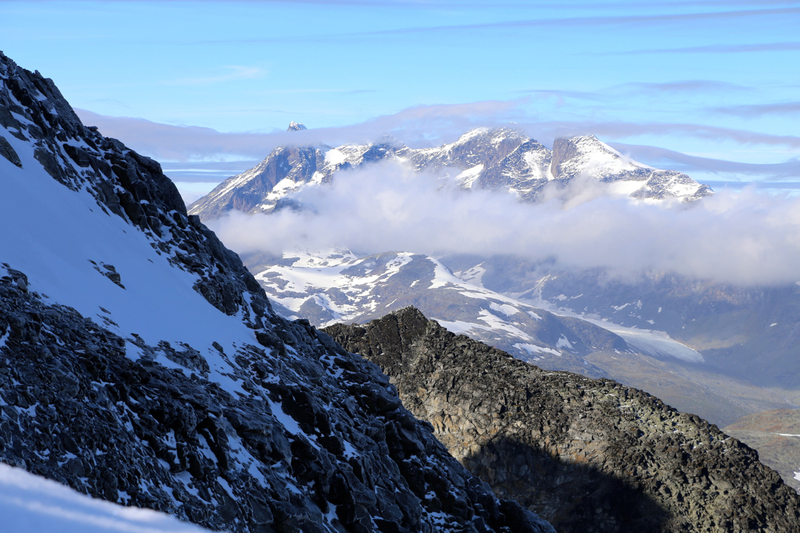 As we made the main crest, a very nice scenery opened up with Hurrungane to the left and the peaks near Smørstadbreen, including Storebjørn straight ahead. We rested and took some lunch that had been made at breakfast. Climbing our first summit, it became very clear that this would be a pretty difficult trip. The time was now 1345. 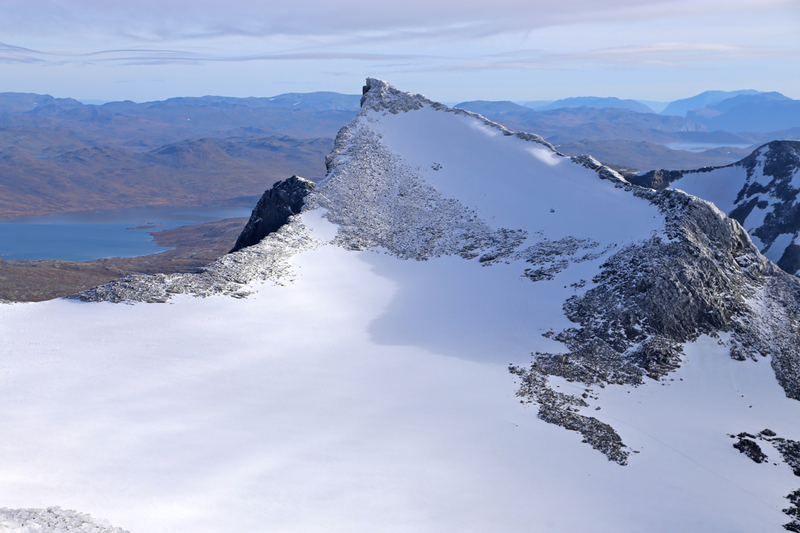 All rocks were covered by a layer of ice and crampons were needed despite the lack of snow. Half the team decided to turn back here and thus only Bjørn, Olav, Helge and I carried on. The descent to the connecting saddle turned out (as expected) to be the hardest part of the remaining route. Care was needed and a few spots had poor snow/ice and no good holds, the only positive being that the angle/slope was moderate. The climb from the saddle to the summit was fairly straightforward, but careful movements with the crampons required time. We summited about one hour after leaving the middle summit and it was pretty clear that we would need all remaining time to make the big birthday dinner scheduled at 1900. We descended more directly down from the slight bend in the ridge and thus saved considerable time. Still, the return hike was long and we were quite happy when the car was finally in sight. We parked outside the hotel at Eidsbugarden at 1859, a quick shower and we were all seated for a wonderful dinner around 1915. 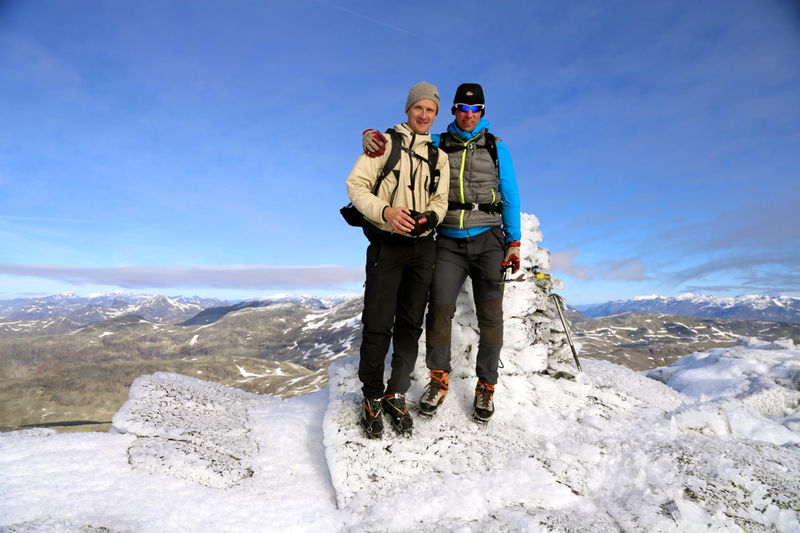 Big thanks are due to Helge for inviting us to his birthday party in such a fine mountain landscape. Also thanks for patience as I was clearly the slowest man both up and down all those icy rocks. 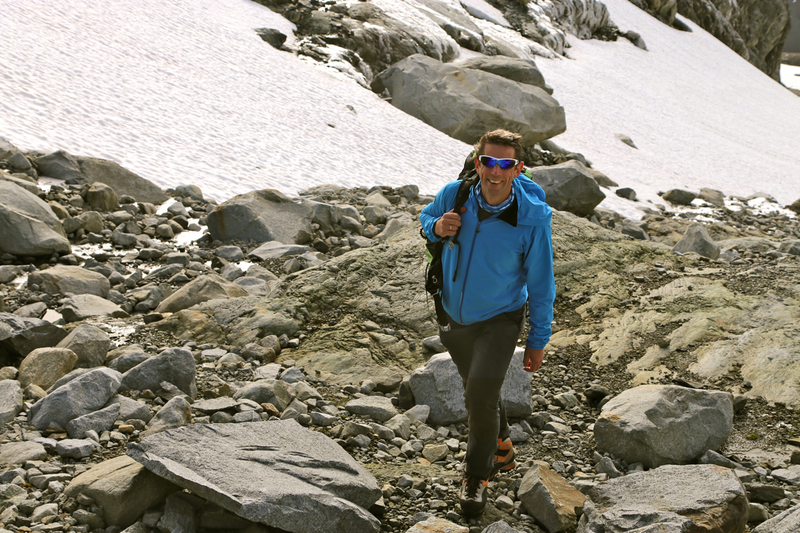 Helge, on his way towards the glacier. Uranostind, as seen from the middle peak. 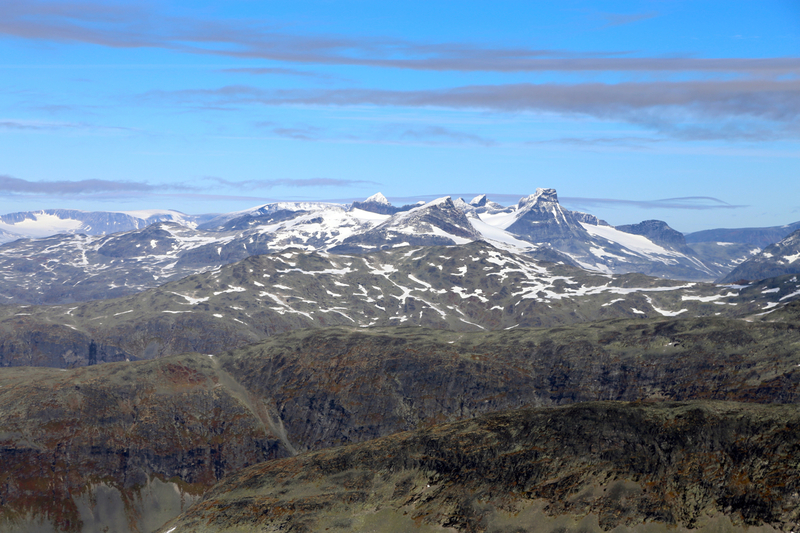 Falketind, as seen from the middle peak. Falketind, as seen from the summit. Hjelledalstind, as seen from the summit. Hurrungane, as seen from the summit. 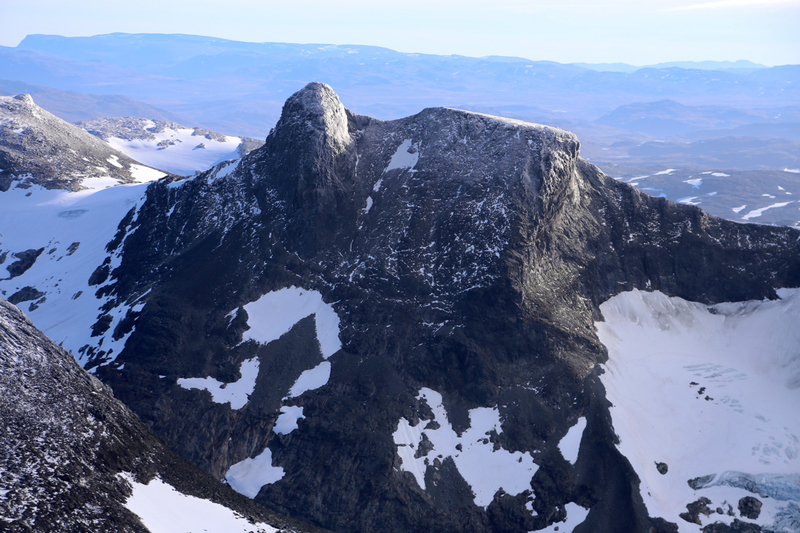 Storebjørn, as seen from the summit.